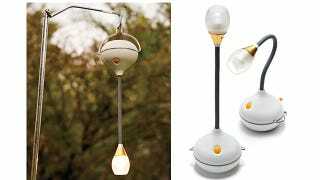 Snow Peak is known for its lighting gear that adapts to the needs of campers throughout the day. And their new Tulip Lantern is the smartest yet, automatically adjusting its throw when it detects it's being used as a hanging lamp. Available on March 9th for $150, the lantern uses the law of gravity to know when it's sitting on its base, where it will shine with a more ambient glow. Or when it's been hung from the roof of a tent, upside-down, where it will automatically change to a focused, narrow beam. And with its flexible goose-like neck, you can actually twist around its head and get it to produce either lighting effect, no matter how it's oriented.